Want an event that everyone will be talking about for years to come? Celebrate at Buffalo’s best escape room: Escape City Buffalo! We welcome private parties of all sizes and types looking to enjoy an Escape Room experience right here in Buffalo. Whether it be for a corporate event, team building, mixer, birthday, bachelor or bachelorette, wedding party event, holiday party or any other commemoration, our spacious private room is the perfect venue. We now allow your group to bring your own alcohol into the VIP Party Room to enjoy a couple of beverages after your Escape Room experience. Our escape rooms are perfect for corporate outings and enhancing performance in the workplace. Our escape games are designed around team building experiences where it is our focus to display the importance of communication within a team. This directly relates to workplace performance and communication within a company. By placing employees in a high-pressure environment where they must rely on each other to advance or move forward, the result is a team who understands the importance of working together. In turn, they work together more effectively. Once the group escapes one of our rooms, they (and you) will find that communication and teamwork happen naturally and different team member will step up to lead at different times. Altogether, the group achieved one goal, escape together. This corresponds with projects within the workforce. Everyone will discover that they are an individual contributor to the end all goal of the project. 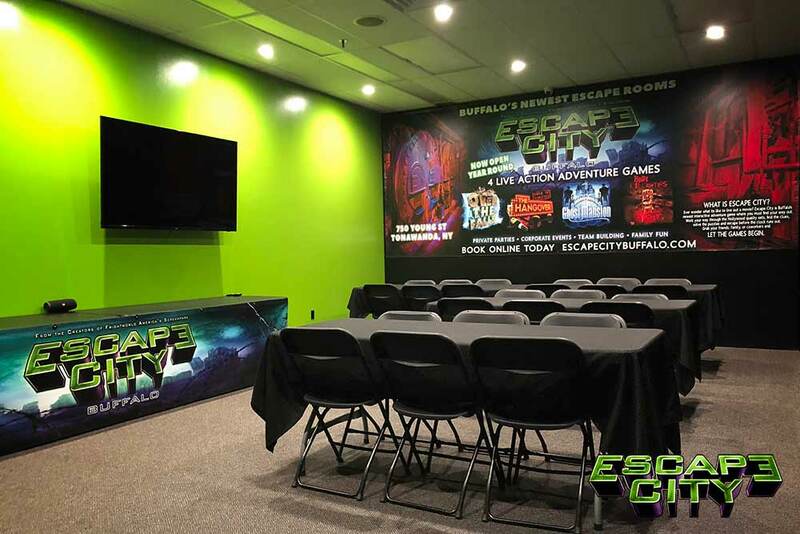 Whether you’re looking to book our Private VIP Room for just a night out with friends/family or to celebrate a birthday party, Escape City Buffalo is a perfect environment. Our VIP Private Room has all the necessities to host your night out and make it a memorable experience. With catering options and the availability of bringing in your own alcohol; your escape experience will be one that will make you want to come back for more games. Enjoy and private area to converse with your friends after you have escaped one of our games! Eat delicious food, have a few drinks and laughs and enjoy the memorable experience with your close ones. Want your wedding party to have the most unique bachelor/bachelorette party? Escape City Buffalo is the perfect way to do so! Take your wedding party to the adventure of their single life. Because the best way to escape from an escape room is with your best friends. The ideal bachelor/bachelorette party is not necessarily a gathering of friends at a bar, night club, limo or any other form of these types of gatherings. If you want to arrange an original farewell to a bachelors or bachelorettes life, book and try to escape our escape rooms. This will be an adventure everyone will remember for a long time. Upon request, we can provide local catering options. We specialize in team building events, large parties, and event planning so your party is in great hands. Contact us today to customize your party needs. You may also like: Our Private VIP Room Is Now Available For Reservation!